Situated in the Northern Thassa, opposite the Vosk River delta and Port Kar, the Isle of Cos is the second largest island in the Thassa sea. Cos is one of the wealthiest islands relying on it's considerable fleet to protect the many merchants that ply their trade from the island. There are four cities on Cos: Telnus, Selnar, Jad and Temos. They all pay homage to the Island Administrator Blade Runner who rules the Island from the City of Telnus. Much of the wealth of Cos is from the vast fields set aside to the cultivation of the Ta grape, which makes a fine wine sought after all over Gor. The only way to enter Cos is by the sea. Any one entering Cos must make at least one post in the sea area before landing at one of the main ports. 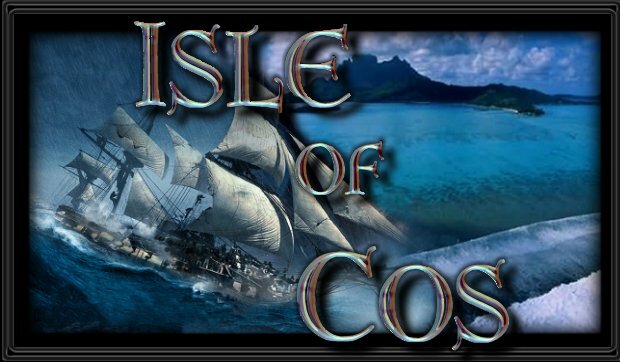 The Isle of Cos is a KILL, CAPTURE and FORCED COLLAR ZONE. No raids will be acknowledged unless two Free Men of the home are present. This also means no slave or Free Woman can be abducted without two Free Men of the Home present at any time. Anyone visiting Cos, either to raid, trade or with a view to visit, should role play to the island in an appropriate manner. The only way to travel to Cos is via the Thassa sea. Anyone entering via the room entry link should first post using one of the Thassa sea PDs. Visitors do not need to disarm when entering Cos. If you are new to Gor simply add the ~o~ to signify you are an observer - private message any questions you might have to a member of the home, however active involvement in the roleplay forfeits the right to simply observe. You are welcome in the Island of Cos. You are expected to be respectful to A/all members. You will be held responsible for the behavior of any slave or Free Woman you bring with you and in the event of a problem you will be given one opportunity to deal with it. If the problem persists then the Island Administrate will step in and handle the matter in a proper Gorean manner. Assassins are welcomed on the Island however must be granted permission from the Administrator before taking a Mark. Free Women (FW) are welcome on the Island of Cos unescorted. FW that overstep their boundaries, or act innapropriately, will be subject to force collaring or caging. Visiting FW from another home, that are gaged, will be ransomed and if the ransom is unpaid within a week they will be collared. Free Women entering Cos must wear proper avas or they will be subject to collaring or caging . Veils are optional, but certainly not needed. Panthers / Talunas would normally be captured if they entered openly. It is of course reasonable for someone to enter under a disguise - though an indication of who you really are should be somewhere in your tags. If during your roleplay it becomes apparent that your are a Panther / Taluna you can expect the guards to try to capture you. Slaves visiting Cos with no owner, or owned but unescorted are subject to capture. An owned slave captured who remains unclaimed after one week will be recollared to Cos. Any slave new to Gor and visiting with ~o~ in their tags may observe withour risk and should keep any questions to private message only. Any interaction in roleplay may result in them being force collared. Yellow Slashed Messengers are honored on the Isle of Cos. Please ensure your proper tags are visible when you enter the home. Please do not private message someone within Cos without first openly asking permission (it is rude and not we will not tolerate it within Cos). Please speak to the Administrator if you wish to join. Remember there is no magic, talking animals, vampires, etc, in Gor. The Administrator's word is the final arbitration on all disputes in this home.